These trees sit on the ridge of Wynberg Hill. I have never established whether they are planted on open land or in someones garden, but they look spectacular from accross the valley. Those beautiful trees that you can see from your garden! They have made a wonderful painting Carol. Your paintings are beautiful. I have been browsing for a while, and i think the Courtyard Hotel did make me linger for a while longer. 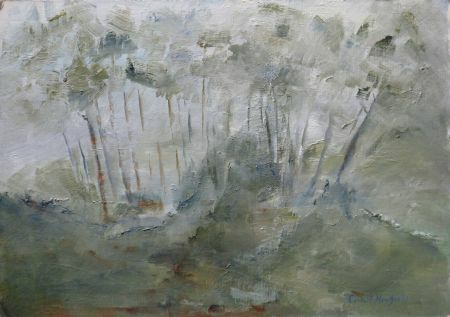 Hi Carol, I love the controlled palette here and the almost abstract quality of the landscape! Thank you for the visit Silver, and for your kind words! Thank you Marie. It was painted very quickly indeed which is probably why it is so free! Enchanting and delicate work. You evoke a delicious mood, Carol!